Every February, toy companies head to New York for Toy Fair. This is an industry only event, designed to show retailers what's in store for the coming year, and to get the information out to the press for dissemination. And every year, for as long as I can remember, there have been exclusives. It seems to me that die cast cars started the trend, with companies like Matchbox, Hot Wheels, Ertl, and Johnny Lightning paving the way, but the action figure companies picked up what they were laying down pretty fast. 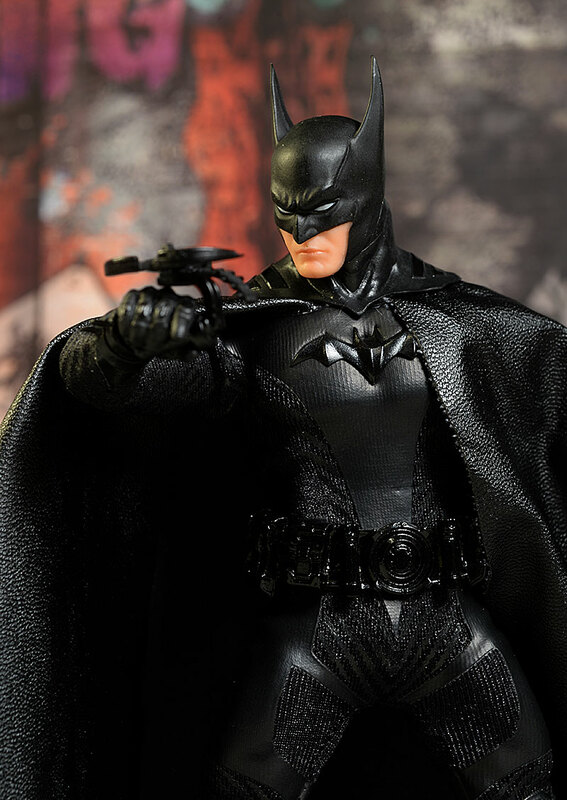 Hasbro, McFarlane, Palisades, Diamond Select, Toybiz, and of course, Mezco, have produced plenty of Toy Fair exclusive figures, which often fade into obscurity. But when a line is really popular - really popular - those exclusives can go nuts, at least for awhile. Mezco has released a One:12 Toy Fair exclusive each year for the last three years, so it's zero surprise that they released one for the 2018 show as well. 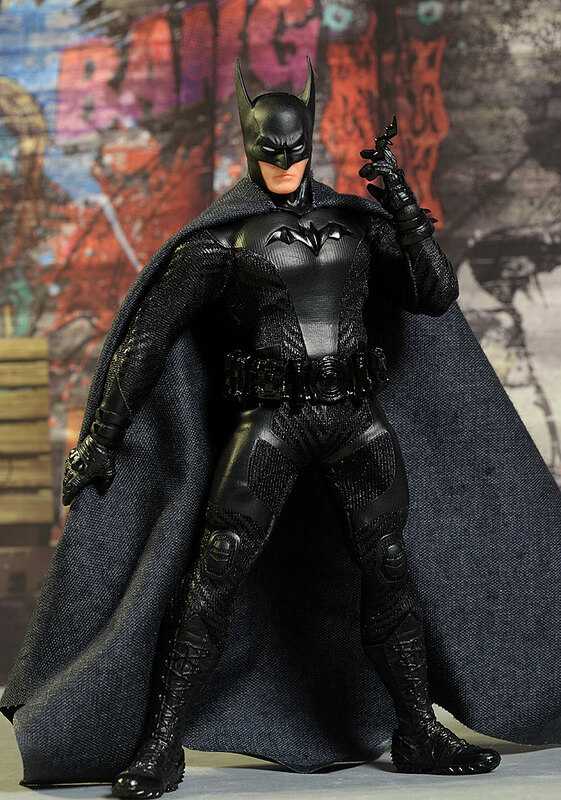 This time it's an all black version of their upcoming Ascending Knight Batman, which will see a regular release (more of a black and gray costume), and a PX exclusive release (blue and gray) in the coming weeks and months. EDIT: crap, I forgot about the third one, the exclusive with the gold belt direct from Mezco! And yes, this thing is going nuts right now. People are asking crazy, crazy money for it, and collectors are getting annoyed. My best advice - calm down, take a deep breath, and wait it all out. It's okay to have grails - it really is. I'm a completist, a serious completist, an OCD sort of completist, and I hate it when there's holes in my favorite collections. And yes, I have two holes in my One:12 Collective collection - tiger stripe Wolverine (my own damn fault), and the first Toy Fair exclusive, the black and white Batman. You know what? I'll get them someday. They're on my list, along with a MIB Marx Best of the West Jed Gibson and a MOC Gabriel El Lobo. I'll have them someday, and I can be a little patient, even if it almost kills me. It's worth it to mention a little about this particular character. 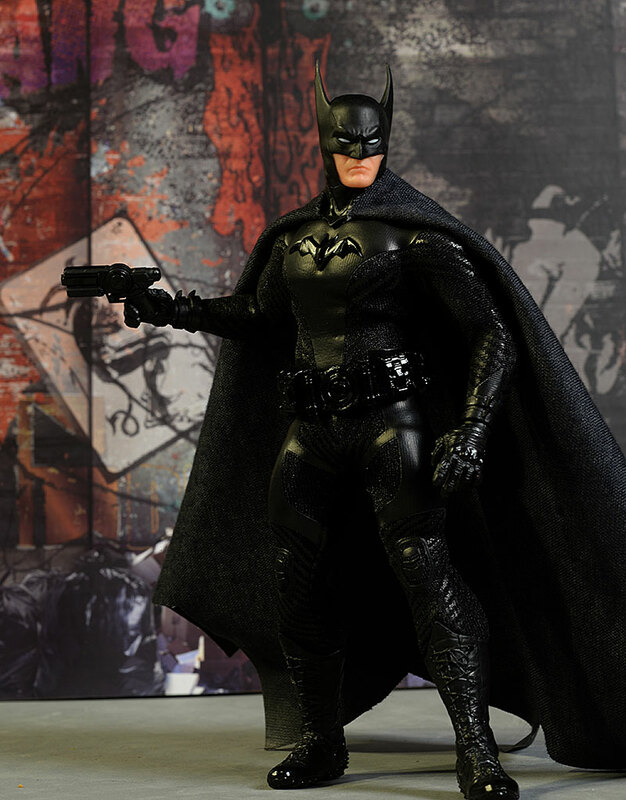 Mezco is producing a set of three original Batman designs, spanning his career. This version is their take on a 'year one' style, combining some of their favorite elements with their own touch. It's a sweet design too, and is sure to be popular. The box is super heavy weight, with thick cardboard and a solid design. It includes the sticker declaring its exclusivity, and it's all completely collector friendly of course. 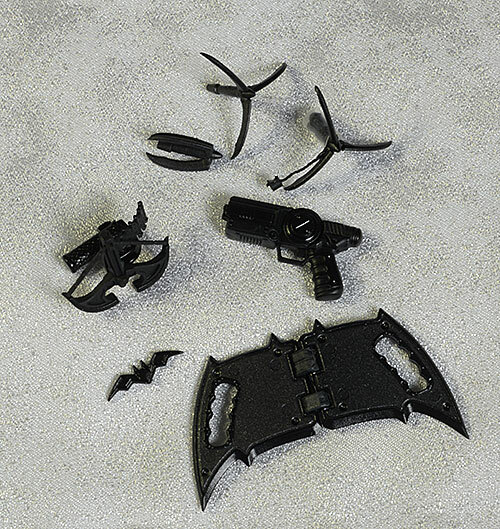 You will have to peel back one of those sticky plastic layers to remove the batarangs, but with a little care you won't have to destroy it in the process. 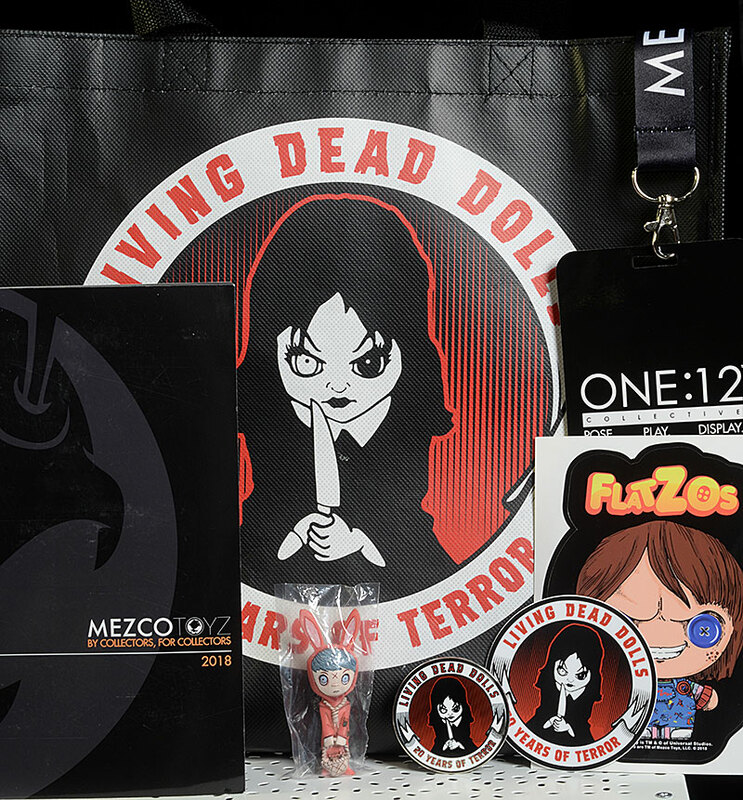 The figure was handed out at the Saturday morning press event, and you actually got a goodie bag with this inside that included a nifty pin, lanyard, stickers, LDD mini-figure, and large color catalog of the upcoming releases for various Mezco lines. Instead of the usual package shot, I've included these extras in the package photo below. All versions of this figure come with two head sculpts - masked and unmasked. 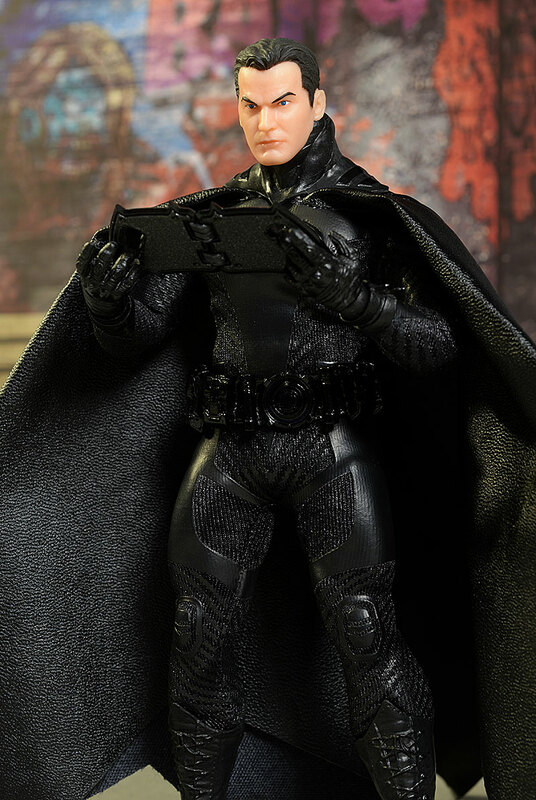 He comes wearing the masked version in the package, and the Bruce Wayne head is separate. The masked version is outstanding - a very cool retro design, with long ears and a wide head. This is a dangerous, deadly look, something you can imagine would terrify any criminal in a dark alley. 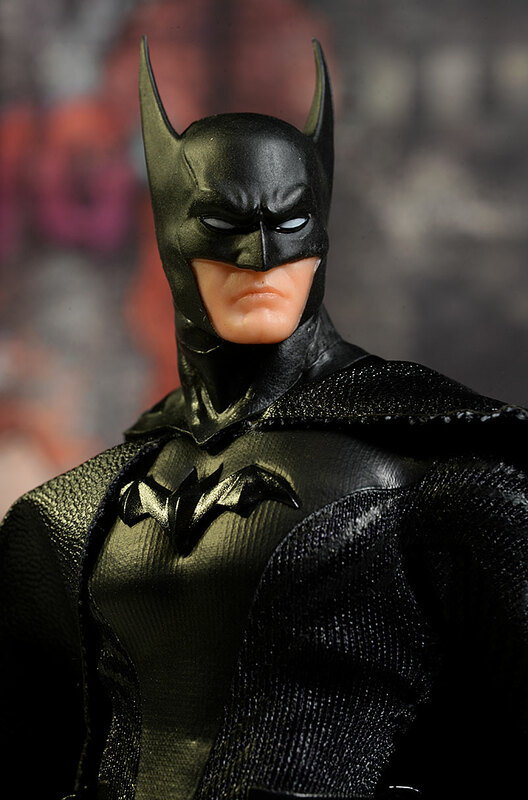 The neck flows into the cowl cleanly, even with the two piece design, and the other sculpted pieces on the body - like the chest symbol, gloves, and boots - are also nicely defined and detailed. The second portrait is unmasked, and really provides a lot of value. That's because you can swap it on to other One:12 Batmen if you'd like, or even pre-order a second John Wick figure if you'd like Bruce in a suit. It's a very traditional Bruce sculpt, something that is recognizable without being specific. There's nice detail work in the hair, and the expression is stern and serious without being extreme or silly. The heads swap easily, and stay in place, as do the various hands. These are sculpted to work with a wide range of poses, as well as specific accessories. It's always worth noting the scale - these guys are tiny. Bruce is just under 6 1/2" without the ears, fitting in nicely with the rest of the line. One area where Mezco has been pushing the quality forward is the production paint applications. They are looking to bring high end sixth scale quality to a much smaller size, and they are doing an excellent job. The paint work on the masked face is just about perfect, with clean sharp lines and no slop. The white eyes are particularly impressive, but the even skin tone and slight variation on the lips looks excellent as well. The unmasked Bruce head is equally impressive - almost. The eyes really get me, with their tiny iris' and pupils. They're straight, even, and pretty much perfect in every way. 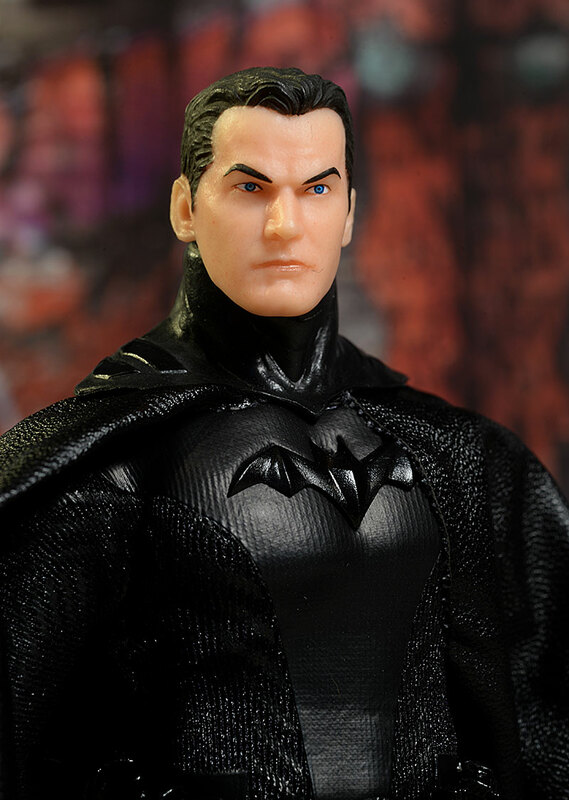 The eyebrows and hairline look great too, and the slightly translucent quality to the skin gives it depth and realism. My only complaint, and the only thing holding him back from a perfect score in this category, is the lips on this second head. They aren't quite perfect, and like Hot Toys, Mezco is setting an extremely high bar for themselves with every release. The accessories look good, but remember - this is an all black variant. Unlike the other two versions of this figure, there's no other color on any of the extras. They do make good use of different finishes however to differentiate with the single color. 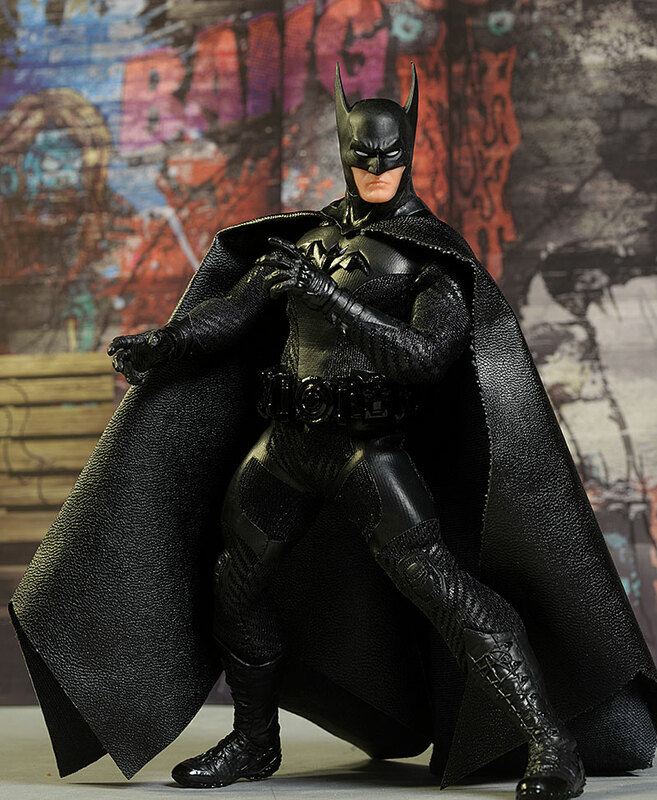 Overall, the superhero body has excellent articulation, allowing for a wide variety of realistic, flowing poses. The neck is a little restricted this time, due to the cowled appearance that bulks it up. You can still get some lean and tilt out of it - and of course, it turns just fine - but it's not quite as mobile as other releases. The tight, soft costume is not a major encumbrance for the rest of the joints. The shoulders, elbows, and wrists combine to create interesting arm poses, and the hips, knees, and ankles allow for deep action stances. The torso and waist can turn and crunch, and the suit doesn't force them all the way back to center. I wish I could get a little more bend out of the elbows, but it's a fairly minor nit considering the overall quality of the articulation. Swapping hands and heads was simple, and they stay in place while posing. Do take some care with the soft rubber spikes on the gloves - I wouldn't squeeze down on them too often or too hard. This variant is fully outfitted with all the same goodies you'll get with the regular release. That's unusual for a Toy Fair exclusive, where they usually cut back on the accessories. I've already mentioned the second portrait, and yes, it goes a long way to boosting this score. 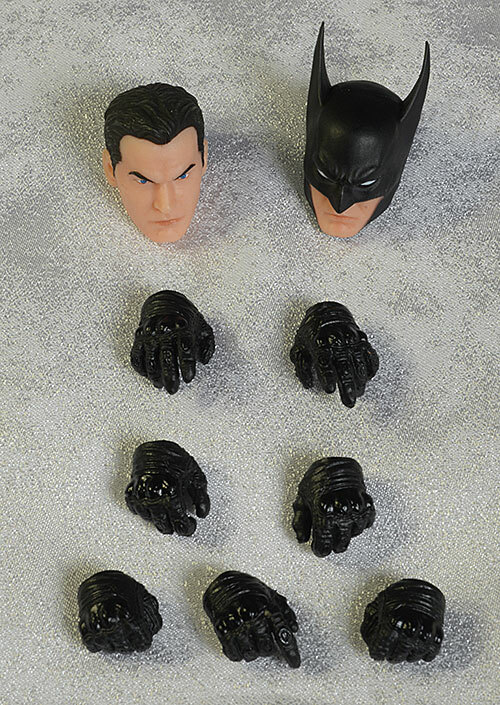 This portrait is particularly useful, since you can use it with other Batman figures. He also has seven hands in total. He comes wearing a set of fists, and there is also a set of wide grip hands, a set of tight grip hands, and one gun grip right. These work nicely with the other accessories, and in a wide variety of poses. He has a grappling gun of course, with a very detailed sculpt. It can attach to his belt as well, and comes with three different tips. One is closed, one is open, and one is open with a long rope and adapter attached. All three can attach to the barrel, and give you a ton of display options. His final 'weapon' is the Bat-dart crossbow. He can tranq his opponents with this baby. Be very careful inserting it into the tighter hands, since putting too much pressure on the wrong spot could result in heartbreak. Finally, there's his display stand. It includes the simple foot peg as well as the large, clear support rod that works great with jumping and flying poses. The Mezco designers took old school concepts and got creative. The result is sweet, head to toe. The cowl has the long ears and wide spread, reminiscent of his very early look. The small bat symbol is also old school, and it is tightly attached to the cloth chest of the costume. 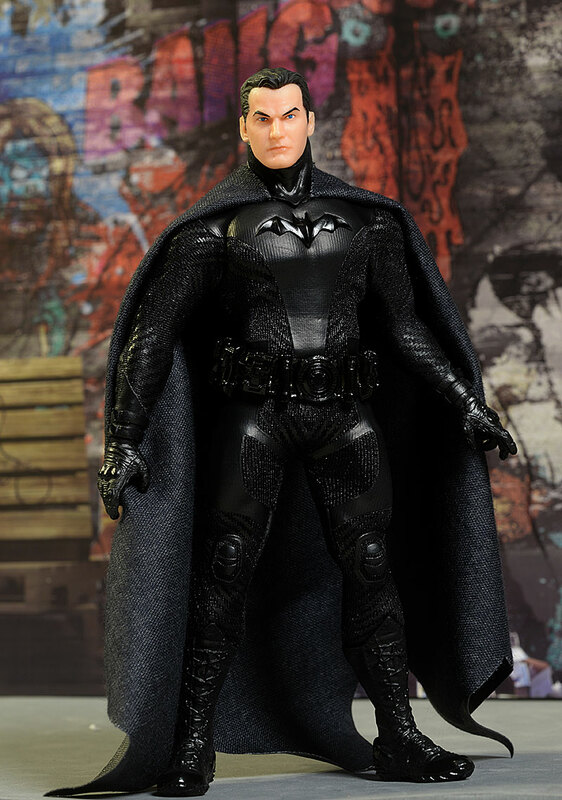 There's a nice mix of cloth and plastic, and the variety creates a much more realistic overall look. The leather-like cape can be folded back or under, exposing either side depending on the pose. The high gloss black belt rides a little high on the hips in some poses, but you can work it down lower in narrower stances. There's a spot on the back of the belt to hold the grappling gun. The boots and gloves look great, and have a military vibe. I have seen people complaining that this all black version shouldn't have been an exclusive, that somehow it's preferable to the standard release black/gray or PX exclusive blue/gray. 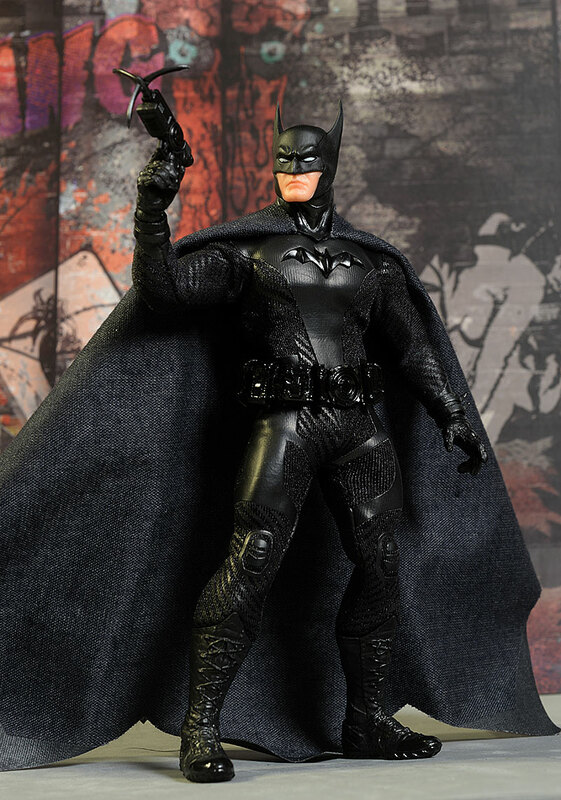 I find that odd, considering the black/gray color scheme is more appropriate to a golden age or year one style Batman. I agree that this Johnny Cash look works for him, but I'm not sure Mezco could have predicted collectors would be that ga-ga over it. Great articulation, useful accessories, and a cool look - he's definitely a fun figure. It's a little disappointing to consider how few of these will actually make it onto a display shelf. You can't really judge 'value' with a free exclusive. If you got one from Mezco, it's an amazing value...if you pay a ridiculous secondary market price on da bay, it's a terrible value. If I were pretending that this was the regular release version at $80, I'd go the average of **1/2 considering the quality of the costume and accessories. But with a special release like this, Value is truly in the eye of the beholder...or wallet of the buyer. This is a figure you really, really, really don't want to damage. I'd take extra care putting the accessories in the hands, especially the dart crossbow. And when you're swapping hands, pay attention to the soft rubber spikes on the gloves. Bending them and squishing them too much could result in a problem. The Toy Fair exclusive figures, in and of themselves, are hard to review. They won't see mass circulation, so why does anyone really care? 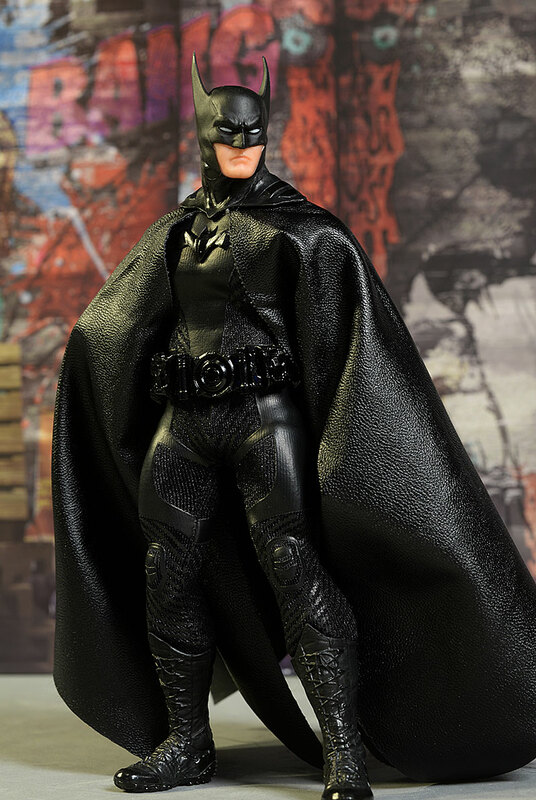 But Mezco uses these exclusives to premiere figures that will be coming to a wider audience in other forms. The best example was Punisher, a terrific figure that first saw light of day as last year's exclusive, and then was released a couple more times. There were some people that ignored how amazing the Toy Fair version was and didn't order the others, and are now regretting it. Don't make that mistake with the Ascending Knight Batman. He's going to be this year's Punisher, a terrific looking design that Bat fans will be all over like hair on a bear. And if you're sad that you didn't get this particular variant, I hear you...but put it on your grail list, and someday when the fly by night fans have moved on (and they do, trust me) you'll be able to complete your collection. I've learned to take a very zen approach to this issue, and OH MY GOD! 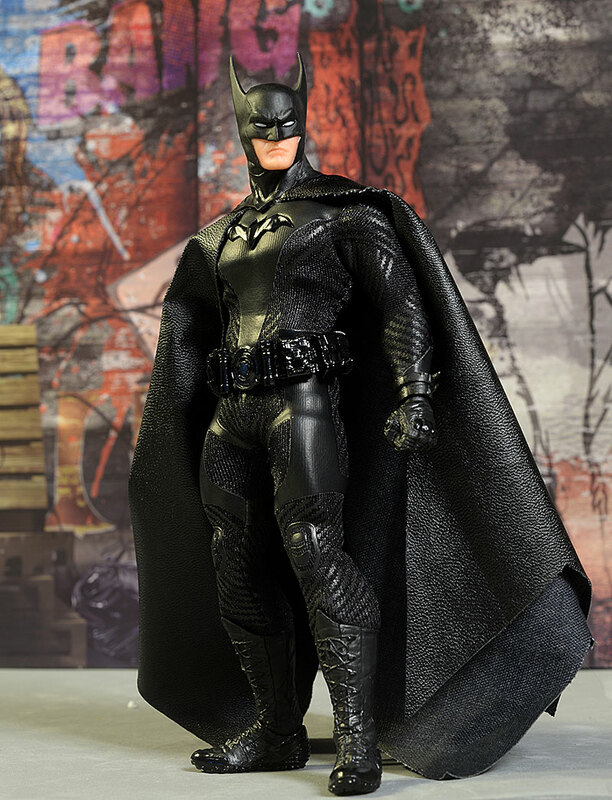 LOOK HOW MUCH THE TOY FAIR B&W BATMAN IS GOING FOR! DAMN IT! - has the regular version for $80, and the PX exclusive version at $85. - also has the regular at $80 and the previews exclusive at $85. - Entertainment Earth has the regular for $80 and the PX exclusive for $85, but also offer free shipping. - or if you really want this particular variant, you can search ebay for a deal. I've covered almost every One:12 figure so far, with the most recent being the regular Spider-Man. Earlier figures include the PX Exclusive Deadpool, the Mezco exclusive Deadpool, the One:12 X-Men Deadpool that was a 'summer' exclusive, as well as the recent Deathstroke, Suicide Squad Harley, the regular Red Skull, classic Superman, and the Morales Spider-Man. I've also covered the the exceptional classic Punisher, the regular release Punisher the Toy Fair exclusive version, Shazam, the classic Daredevil, the Flash and Reverse Flash, the BvS Superman, the comic based Joker, Green Arrow, the Frankenstein Monster Diorama, Frankenstein Monster, the BvS Batman, the Bvs Armored Batman, Captain America, Star Trek Kirk, the Mirror, Mirror and Cage variants of Spock, Sulu, the Toy Fair exclusive Spock, and the regular release Spock as well. Other One:12 Collective figures released so far include Dredd and his Lawmaster, the NYCC exclusive Judge Dredd, the DKR Batman and Mutant two pack, the Batman exclusives, and the initial DKR Batman.